To start summer off right we've joined an amazing group of ladies for a summer tablescape tour. If you're heading over from Alma's post welcome. Isn't she so talented?! With temperatures rising and kids getting out of school, summer is officially here friends and we are so excited. We're excited because summer is our absolute favorite season (these Texas girls love the heat), but also because there are so many exciting things happening in this season. One of those things is mom (Michelle) got a new puppy named Sadie Mae, hence the blog titled dog days of summer. Of course that cutie took over our summer tablescape shoot. The second thing we're excited about is that we're moving into our storefront next week! More on that to come, but we couldn't be more excited about it. We've shared time and time again that hosting and gathering is something we are so passionate about. When we began brainstorming for tablescapes we had trouble sticking to just one, so below you'll see our two favorites: one with bright pops of color and the other more neutral and classic. Citrus fruit and a mix bouquet of flowers are a simple, inexpensive way to dress your table for summer parties. We found all this, one stop shop at Costco! Everything except the oleanders that we used to dress our rattan chairs. We clipped them from our neighbors back yard. But we shared some punch and pineapple in exchange. The mix match blue and white dishes are a favorite. We used some more clippings of magnolia and a palm frond in fun white vases. And our real touch green magnolias look like fresh clipped flowers even next to the real thing. Add a seashell and we had this table ready for friends in just a matter of minutes. 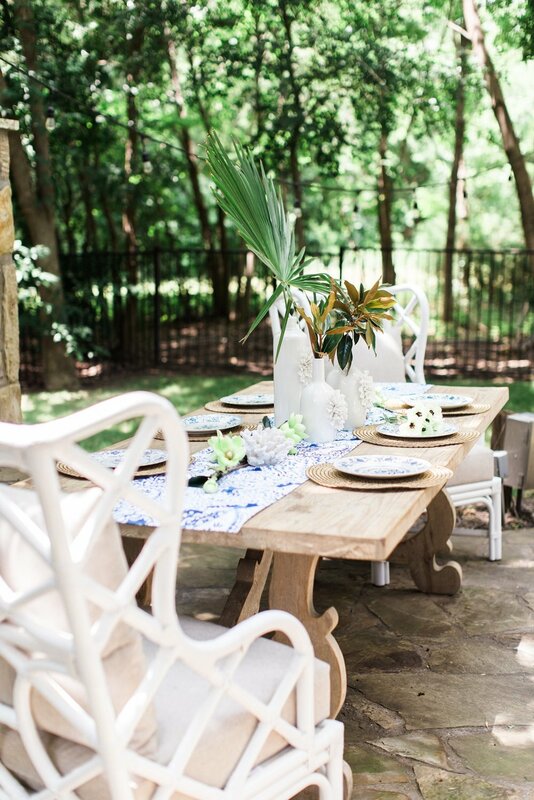 Below the images you'll find the link to the next blogger on the summer tablescape tour! Im so excited you've joined us on the summer tablescape tour. For more summer inspiration head over to Jessica's blog (Honey n Hydrangea)! You're going to love it!